Find daily strength for your walk with God from women who understand! Wherever you are in your spiritual journey, Lysa TerKeurst and the women of Proverbs 31 Ministries exist to be trusted friends who understand the challenges you face. We are here to walk by your side and cheer you on as you grow closer to the heart of God. As a subscriber you’ll receive the following content designed to encourage and equip you in the many roles, relationships and responsibilities God’s entrusted to you. 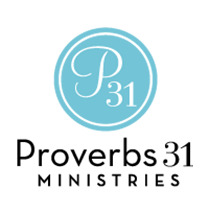 Daily -- Encouragement for Today Devotion: Proverbs 31 Ministries devotions are hopeful, relevant and down-to-earth. They bring peace by filtering everyday life through God’s truth and answer the question every woman asks: Am I the only one who struggles with this? Daily -- Everyday Life Radio Podcast: Find real hope and real solutions for real-life struggles with Lysa TerKeurst and Renee Swope through down-to-earth, inspiring and relevant biblical messages in 60-second bite-size pieces. Channel content is released on a pre-set schedule and will be delivered to your Daily Feed accordingly. As a subscriber to this channel you may receive additional communications from this organization.